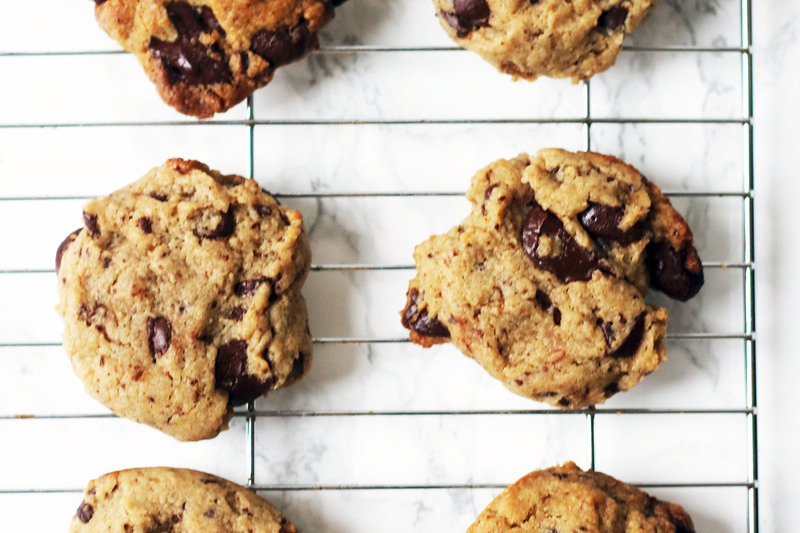 Spoonfuls of tahini and a sprinkling of salt take these vegan chocolate chip cookies from good to AWESOME. Get the recipe below. Thanks to Indigo Herbs for supplying the tahini. It’s no secret that I enjoy my sweet treats. In fact my Instagram best 9 this year was almost exclusively cake! So, when I decided that I would take part in #veganuary this year I knew I was going to have to perfect vegan baking and first on my list was the humble chocolate chip cookie. It was Ceri from Natural Kitchen Adventures who first introduced me to the idea of adding tahini to a cookie recipe. I am a big fan of tahini in savoury dishes and Indigo Herbs had kindly sent me both white sesame seed tahini and black sesame seed tahini to experiment with so I set to baking a batch or two. I will admit, my first batch of cookies was not great. We jokingly called it “vegan sand” as even though there was a tonne of sugar, plenty of tahini and lots of extra virgin olive oil it somehow came out like a really fine, crumbly shortbread. Not quite the texture I was going for. After a bit of trial and error I realised a milk substitute was desperately needed. 2 more batches later and we had the final recipe! I’ve baked a tonne of these cookies since (gifting them to anyone who will take them) and they’ve been very well received. Olive oil, tahini and sea salt aren’t necessarily the ingredients you would expect to find in a cookie recipe. But, they all play an important part. The olive oil is the fat. We all know that fat is what tastes food taste GREAT. It’s also a good source of moisture and keeps them nice and chewy. The tahini brings a wonderful earthy flavour. There may be 200g of sugar in this recipe but the tahini and dark chocolate make sure these aren’t too sweet. The sea salt is perhaps the least controversial of these 3 ingredients. We are all used to seasoning our food and I’m a strong believer that we should be doing the same with our bakes and desserts. The salt helps enhance the other flavours of the cookies making them taste incredibly decadent and moreish. Rather than adding a pinch of salt to the batter I like to sprinkle flaked sea salt over the top of them before they go into the oven. If you’ve detected a hint of pink in the salt on the photos then you’re absolutely right – Himalayan sea salt also works well if you don’t have sea salt in the cupboard. 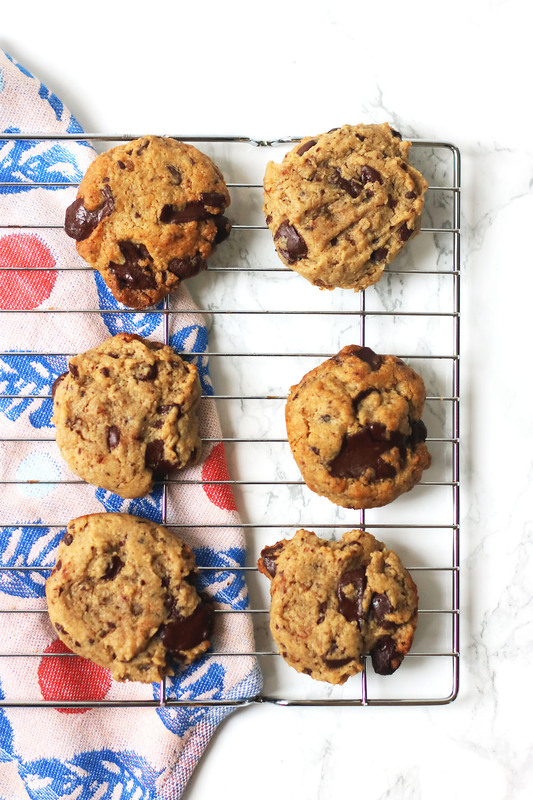 Spoonfuls of tahini and a sprinkling of salt take these vegan chocolate chip cookies from good to awesome. In a large bowl, whisk together the tahini, olive oil, brown sugar and vanilla paste for 2 minutes. Once the sugar has dissolved, stir in the plain flour and baking powder. The mixture will be quite crumbly. Next add in the dark chocolate and stir through until evenly distributed. Pour in the milk and stir until a sticky dough forms. Line a baking sheet with grease proof paper. Take roughly 1 heaped tbsp of the dough and spoon onto the baking sheet, each spoonful roughly 2 inches apart. Repeat until you've used up all of the mix or the baking sheet is full. Using wet fingers, carefully pat the dough until its roughly a circle shape and relatively flat. Sprinkle the sea salt over the raw cookies. Place in the centre of the oven and bake for 15 minutes or until the cookies have started to brown (repeat if you were not able to use up all of the mix on your first baking sheet). These cookies taste best when they are freshly baked but can be kept in an air tight container fora week. You definitely don’t have to be vegan to enjoy these cookies. If you’re not following a vegan diet then you can always swap the soya milk for regular milk. Are you trying veganuary this month? What are you struggling with most? Let me know if there are any vegan recipes you’d like to see in the comments below. If you’re looking for more vegan recipes, check out my Veganuary Resources page with recipes from Supper in the Suburbs and some of my favourite food bloggers in the UK. I agree you don’t have to be vegan to enjoy these cookies. They look wonderful and I’m curious to try them. I’ve never thought of using tahini in cookies. So creative! This is unique and vegan, sure to love them. Tahini in cookies sounds interesting. Will definitely try them out. I am not even vegan and these cookies sound amazing!! I love the tahini, olive oil and sea salt!! I am definitely giving these a try! They’re definitely something vegans and non-vegans alike can enjoy! You’d never know they were missing dairy! I’ve been meaning to try tahini in cookies myself, as I agree I can see the flavor being tasty. Must give these a try as they look and sound tasty then experiment myself! These look so good! I need to make them! Vegan Chocolate Chips with Tahini, YES PLEASE!! These look delish! Ah. So pleased you like thm. They are very moreish!